Pantelis Voulgaris had visited Naousa two years ago, so he knew exactly what difficulties we would be facing during the shootings. His biggest concern was of course not to lose any images (of certain important moments) of the traditional custom, that he needed for his story. Careful planning was of great importance for the success of the undertaking. Due to all the above and with budget limitations in mind, the recording format chosen (for these specific shoots) by Mr. Voulgaris and his DOP Nikos Kavoukidis was digital and not film. The use of memory cards, simplified the effort to a great extend. We had more than enough sticks for the three main cameras to cover the whole event. In addition to that (with the co-operation of the municipality of Naousa) we used one of the rooms of the city’s town hall as a “base camp”, where a laptop and additional hard drives waited for the material. I cannot even begin to imagine what would have happened if we needed film magazines every 11 minutes, for these straight ten hour shoots with no retake chances! I have to mention that this was the first time Mr. Voulgaris used the digital format in one of his movies, a “risk” that most filmmakers of his age and caliber wouldn’t take. 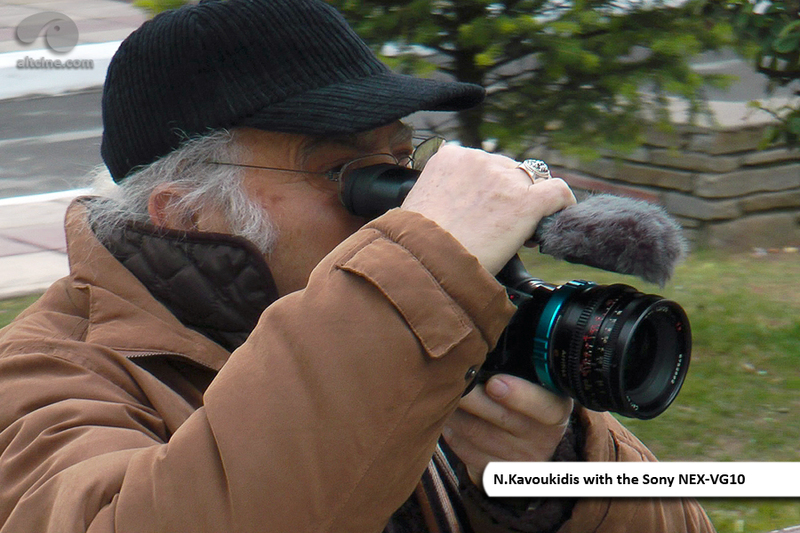 “The cameras need to be small”, Mr. Kavoukidis (one of the masters of handheld cinematography in Greece) said in one of our pre-production meetings. This decision gave the opportunity to the camera operators to be more nimble and flexible, while helping us to avoid interventions in each other’s shots. 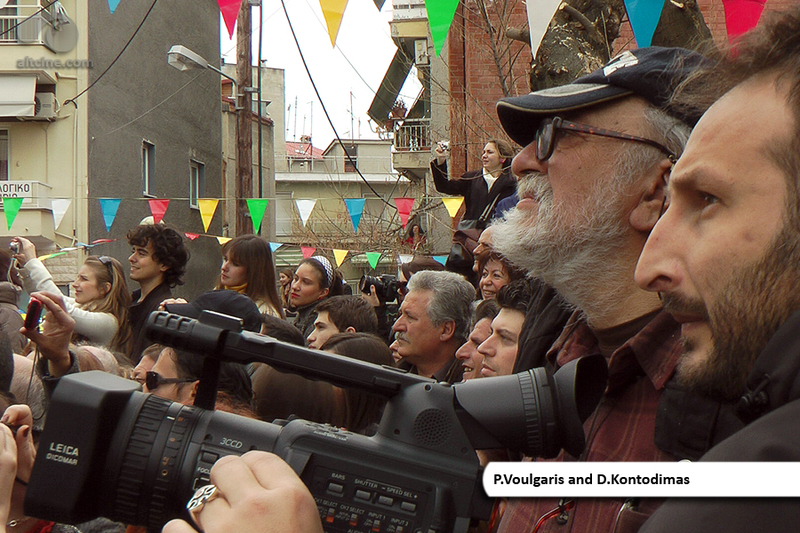 Even though Mr. Voulgaris had arranged for a steadycam operator to come for the second Sunday shoot, it didn’t happen. After experiencing the first shoot and watching the material, he came to the conclusion he didn’t need the steadycam shots. 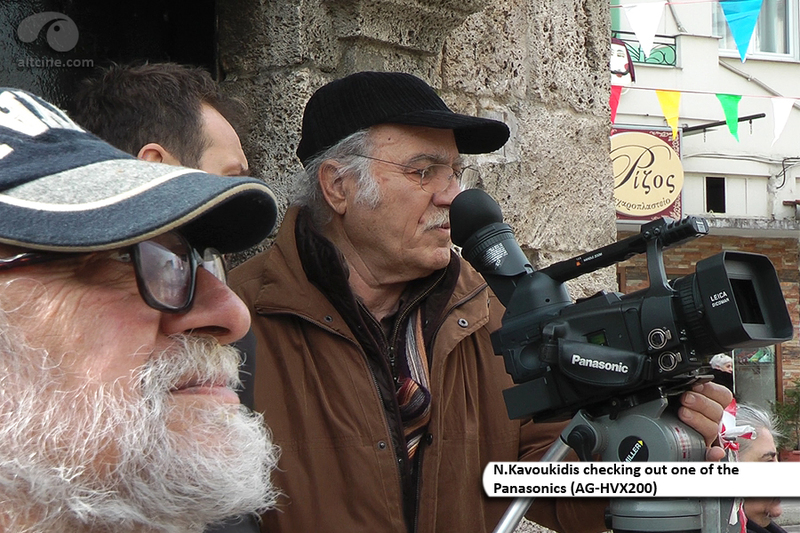 Furthermore, the roads in Naousa were too small and crowded for a steadycam operator to work. 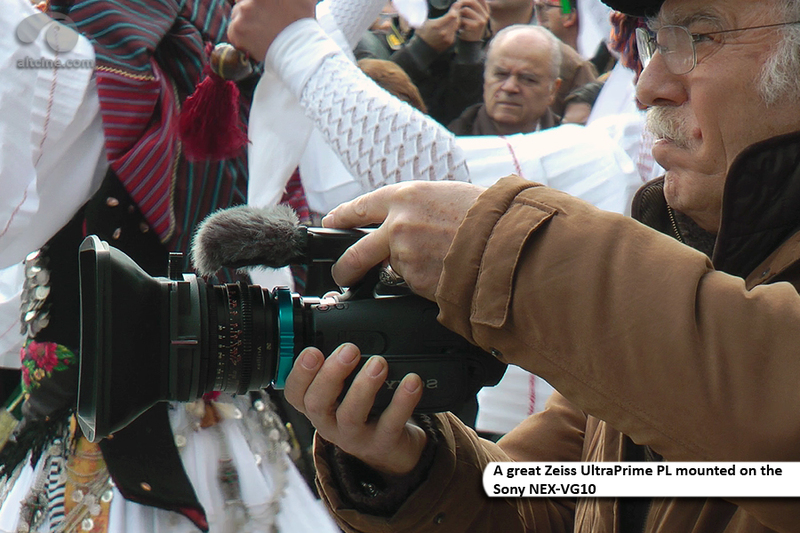 Sony NEX - VG10 with PL mount adapter and Zeiss Ultra Primes lenses set. 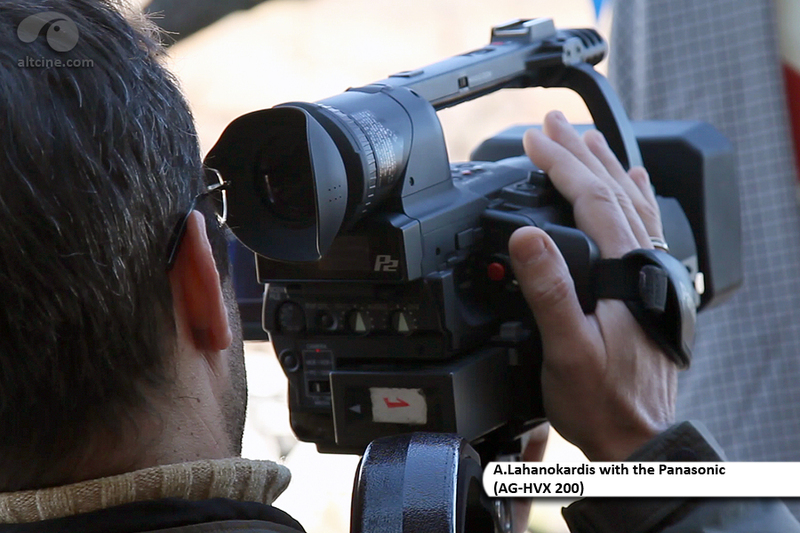 Panasonic AG - HVX200 (we had two of these). Canon 7D using a Tokina 11-16mm PRO DX and a Canon 24-105mm IS USM. I had altcine’s Canon 7D with me, in order to shoot some backstage material, when I had the time in-between Mr. Voulgaris’ shootings. (That’s a cool little camera with sensor dimensions equivalent to S35mm film...). During the first Sunday, and while we were shooting, Mr. Voulgaris asked me to do some b-roll close-up shots for his project! (The Canon lens focal length, adding the 1,6x crop factor of the 7D equals to a great 168mm telephoto...). After he and Mr. Kavoukidis watched my material the following day, they decided to use me as a main operator for next Sunday’s shoot. 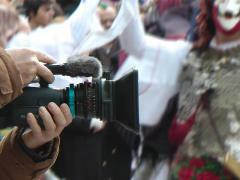 A truly unexpected turn, given the fact that my cinematography experience was limited to short low budget movies only! (Well, I’ve done lots of them...). Knowing that different sensors combined with different lenses will give different results, we did extensive on-camera tweaking in order to match all of them (at least chromatically). Of course some deviation in color rendition was expected (after all each camera used different encoding format), but I think the post-production people who΄ll work on the material will be positively amazed (for once...). 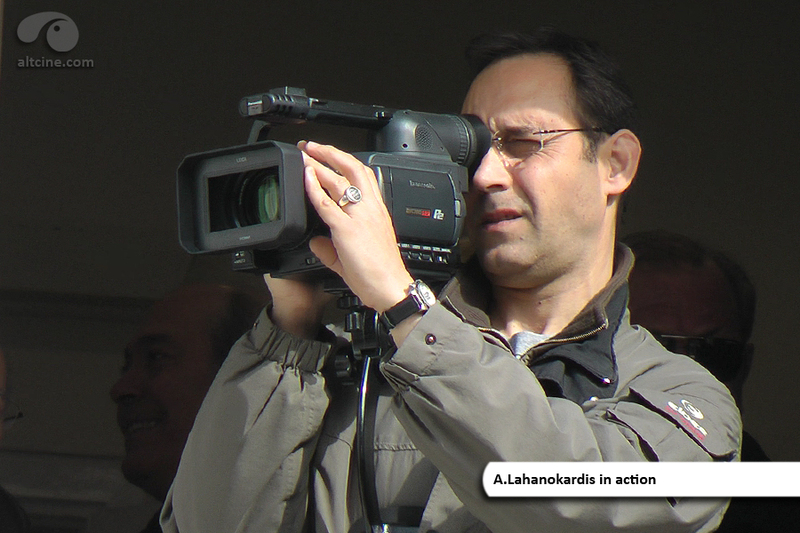 According to Mr. Kavoukidis the rest of the movie won’t be shot with these cameras. The recording format will remain digital, but the hardware will be “state of the art”... Maybe a Sony Cinealta or an Arri Alexa. **Special thanks to Makis Mantas for the additional photo material.